As the full-time caregiver of a busy toddler, I’m always on the lookout for interesting, skill-building toys for my daughter. And it’s not always easy to find them! You see, I am very particular about toys. Because the truth of the matter is, many toys that are marketed as “educational” aren’t actually so, and some have actually been shown to decrease opportunities for learning! Since Little Bo spends so much of her time at play, and since play is such an important part of a child’s physical, cognitive and emotional development, quality toys are kind of a big deal for me. This one is pretty obvious. Are there small parts that could be swallowed or easily break off? Is she going to poke her eye out with it or stab herself if she’s running and trips? Can the toy be played with in many different ways? Does it foster creativity and imagination? Is the toy adaptable? This is perhaps the most important thing I look for in a toy, since it means the toy will have a lot of replay value and I can get my money’s worth out of it! But this is not to say that close-ended toys are bad, either. 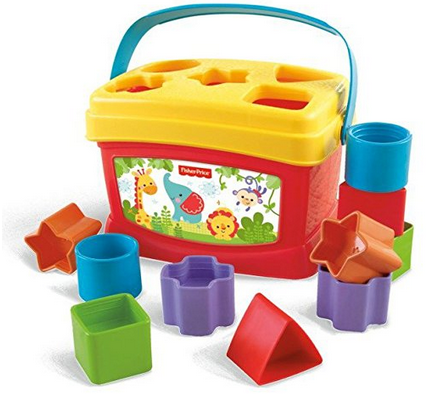 Puzzles and shape sorters are toys that can only be used one way but teach valuable skills, including task completion. A talking robot toy that moves around when you push a button–while certainly entertaining–is less of what I’m looking for. What other skills can I teach using this toy? A toy like the large bead and string set my daughter has teaches patterns and fine motor skills, but I can also use it to teach colors and shapes. A tea set can be used for pretend play, but can also facilitate teaching manners and taking turns. I don’t always buy Little Bo toys marketed to her age range. She is supervised with toys that are geared toward slightly older children, and I provide the support she needs to figure out toys that are just a teeny bit beyond her. By providing this “scaffolding,” children are better equipped to figure out new challenges. So while I generally look for toys that are age-appropriate, I also consider how developmentally ready Little Bo is to learn something new. If it is electronic, why? Studies have shown that traditional books and toys tend to promote language development better than electronic toys, which have a tendency to discourage the kind of parent-child interaction you would otherwise see. Electronic toys also tend to be less open-ended. But that doesn’t mean all battery operated toys are bad! Electronic toys that encourage parent-child interaction are great, and sometimes batteries can help a toy be more open-ended. Electronics only start to become problematic for young children when they discourage or eliminate the need for parent-child interaction and conversation. Am I interested in it too? I don’t expect to be as enthralled with a toy as my daughter is, but I like what I buy to be something I don’t mind playing with, either. Because let’s be honest: As a stay-at-home mom, I do a lot of playing! And it’s nice when your child’s toys don’t make you go crazy. We got this toy for Little Bo when she was about 11 months old. She was already walking, but her feet didn’t quite reach the ground on this yet. Didn’t matter! She loved when we would push her around on this and quickly learned how to propel herself. We LOVE Little People! 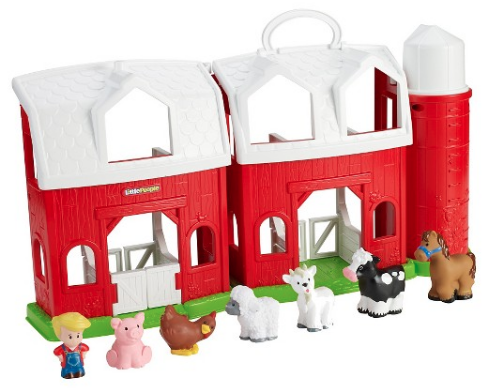 We have this farm playset and the dollhouse playset, which my daughter got for her first birthday and has enjoyed ever since. 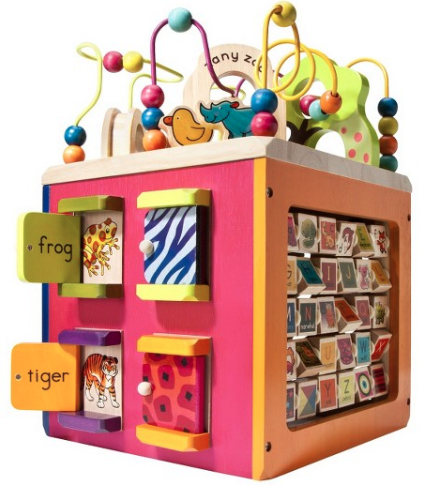 The figurines are cute and durable, and the playset is perfect for teaching animal names and sounds. We also have the Animal Rescue playset and Noah’s Ark. 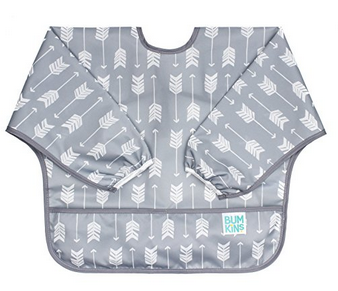 I love that these fold up and all the pieces are able to be stored inside! 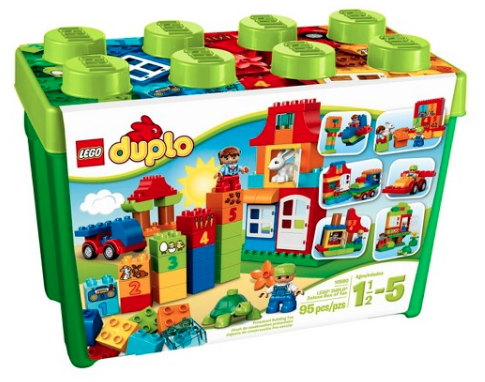 You literally CANNOT go wrong with a Lego Duplo set. This toy is basically the definition of open-ended! My daughter is too young to build anything exciting on her own, but she loves stacking and unstacking the blocks and watching Daddy build (because let’s be honest, Daddy was the one who got us on the Lego train). We will get years of fun out of these. As children approach the age of two, their capacity for imaginative play starts to increase. 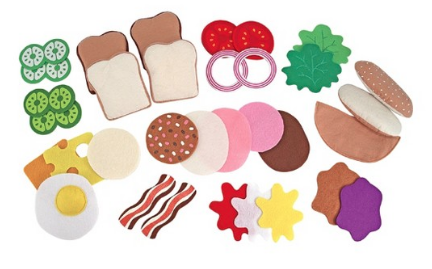 These felt food pieces are super fun and will have lots of replay value as Little Bo gets older and more interested in pretend play. Right now, her favorite thing to do (besides making sandwiches with me) is wear the onions on her head like a hat. Young children love to imitate. So why not get some help with the housework? My daughter loves to push her broom around while I’m cleaning the floors. This is another toy set that will have loads of replay value as she gets older. 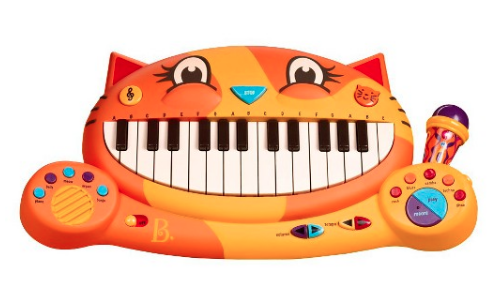 We discovered Little Bo’s penchant for song and dance with this adorable keyboard! I liked this one in particular because it included the black sharps and flats keys, plays different beats/rhythms, and plays a bunch of different nursery-rhyme-type music. My daughter loves dancing to the music and shaking her behind to the beats! They also make a dog shaped guitar, which is adorable and just as fun. 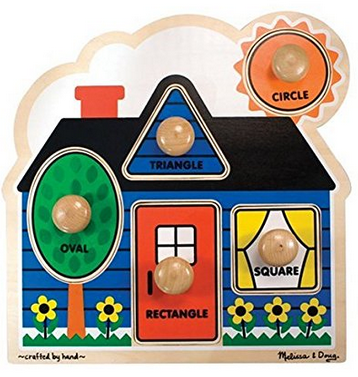 Melissa & Doug make AWESOME puzzles! 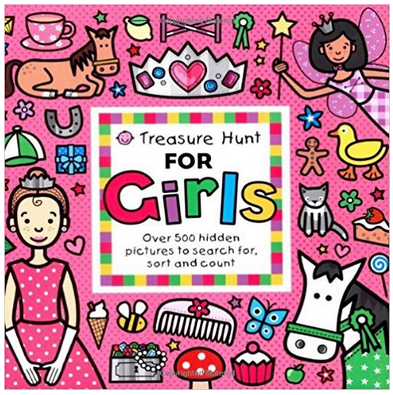 This was my daughter’s first and favorite puzzle–that is, until the square piece found its way into the dirty cloth diaper pail and didn’t survive the journey!! We’ve since gotten her several more Melissa and Doug puzzles, and she loves them. This is another Little Bo favorite! 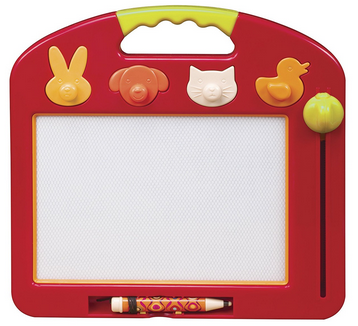 There are hours of entertainment to be had with this magnetic drawing board. Little Bo loves to draw, and we’ve used it to start teaching her letters and numbers. 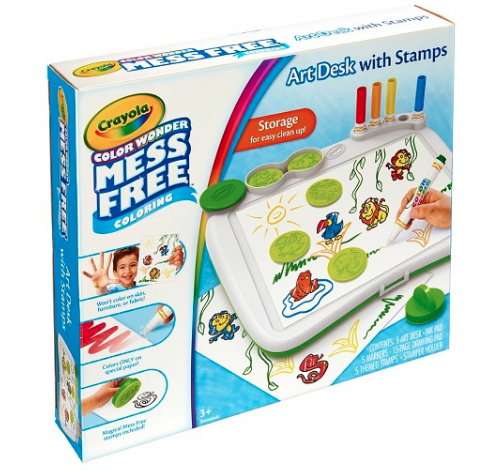 Perfect for messy sensory bin play and artistry! I SO wish we had this smock from the very beginning. Alas, we did not. And Little Bo’s wardrobe reflects that! If you don’t want to worry with a smock, get these mess-free markers! Good luck drawing on my walls with these, Little Bo–it ain’t happening! Right now, besides drawing, Little Bo’s favorite way to play with these are to hold them (preferably with the cap OFF). Yep, just hold them. Whatever makes her happy, I guess? This activity cube is actually perfect the moment baby starts to stand up, but I think it starts to be really appreciated closer to when baby turns one. Lots of opportunities to teach about shapes, colors, letters, and animals! My husband and I happened to find this book at Homegoods one day, and it has been a fantastic buy! Each board book page has a scene with a bunch of different objects to hunt for. Little Bo is a little speech delayed, but this book demonstrated that she could identify FAR more words than she was capable of saying. It’s also helped with some language acquisition! Buyer beware: One page of the girl book contains a “Wizard” and references to magic, which you may or may not be okay with. Melissa and Doug makes the best stuff! Are you seeing a pattern here? 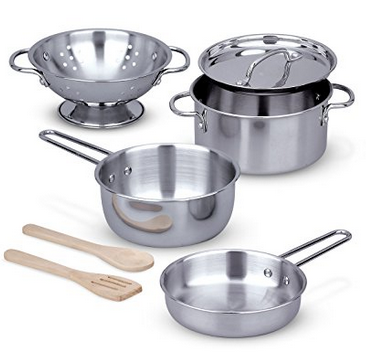 These pots and pans are durable and realistic (as realistic as play pots and pans get, anyway) and make for all-around good fun. You simply cannot go wrong with a great set of blocks. My daughter loves stacking her blocks and knocking them over, and this toy has been a Little-Bo-pleaser for over a year now. 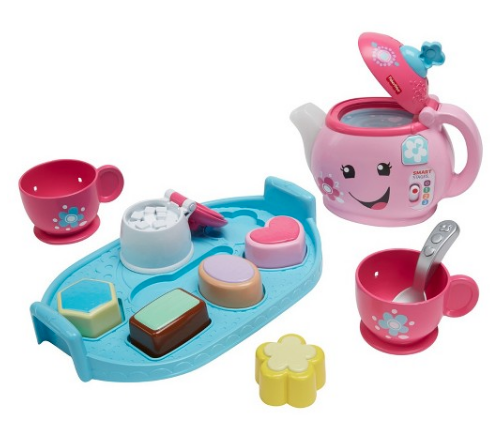 At first I hesitated on this one because I have a natural skepticism when it comes to electronic toys, but this is an adorable tea set. It’s a good way to encourage pretend play, the tea pot lights up and makes a pouring noise when you tilt it, and the tea cakes are basically a shapes and colors puzzle. Cute! I don’t know how you feel about “leashes,” but personally they don’t bother me. If a leash keeps my flight-risk child out of the middle of the street while my hands are full, so be it! That said, Little Bo has never taken kindly to this safety harness, and I usually wear her anyway (even at 21 months–definitely doable with the right carrier), so I never pushed it. 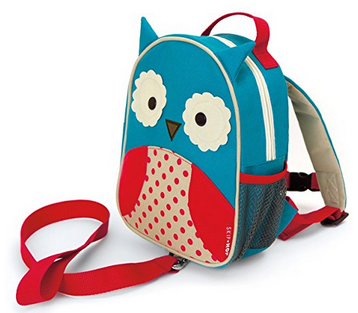 The “leash” part unhooks, and you have an adorable, perfectly-toddler-sized backpack. Little Bo loves this backpack so much that “backpack” was actually her first word after “Dada”! 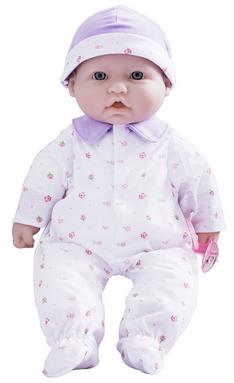 I have been on the hunt for a great baby doll for a while now, and I think this one fits the bill. I love that it’s actually sort of baby looking (check out the images of it–the toes and hands are so cute!) and it’s a great size! We plan to get this one for Little Bo this Christmas so she can take care of her own baby and get used to the idea of us possibly having another in the future. Okay, okay. 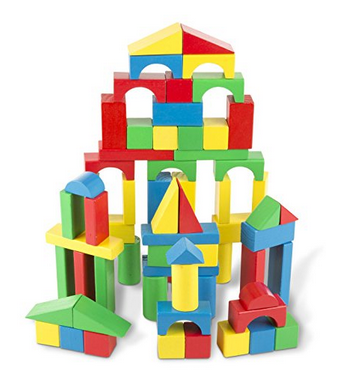 Here’s the honest truth: I WANT ALL THE MELISSA AND DOUG PLAY SETS! They’re all just such quality toys! And even though Little Bo is only on the cusp of imaginative play, I think these play sets are nonetheless a great buy. 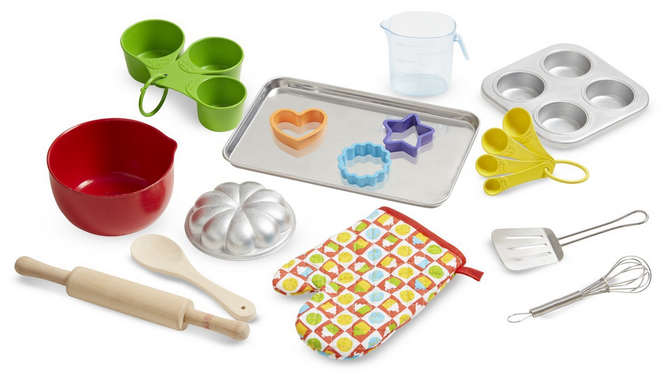 I loved toy kitchen stuff in particular as a child, and I love sharing that part of my childhood with my daughter! Does this count as a toy? I’m saying yes, because this trike is awesome. It’s the perfect size for a small child and can be used as young as nine months old! 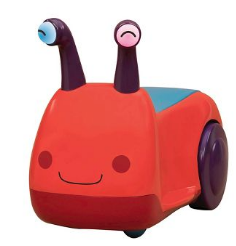 I believe you can buy the trike separately, and we plan to get this for Little Bo this year for Christmas. What’s on your child’s wish list this year?